Deciduous shrub or tree, 1-5 m tall; pointed axillary buds without stalks; bark scaly, sometimes lichen-covered, yellowish-brown or grey. Alternate, deciduous, smooth, finely toothed 1-2 times, oval with pointed tips, 4-10 cm long, brownish in the fall. Inflorescence of male and female catkins which open at the same time as the leaves on current year's growth; male catkins unstalked. Small nutlets, with broad wings; female cones 1.5-2 cm long, egg-shaped. Moist slopes, streambanks, avalanche tracks, bogs and fens in all zones; ssp. crispa frequent in N BC, ssp. sinuata common throughout S BC, becoming less frequent and transitional to ssp. crispa in N BC; circumboreal, E to PQ and S to NC, MN, CO and CA. 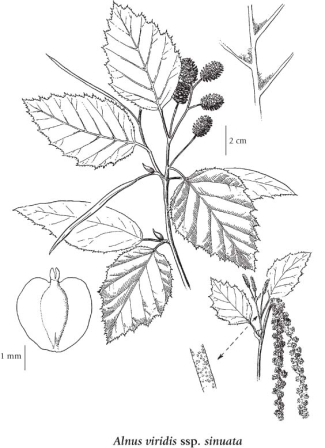 Alnus alnobetula (Ehrh.) K. Koch p.p.